Donald Sterling exposes an uncomfortable truth about ownership, race, and power in the NBA. 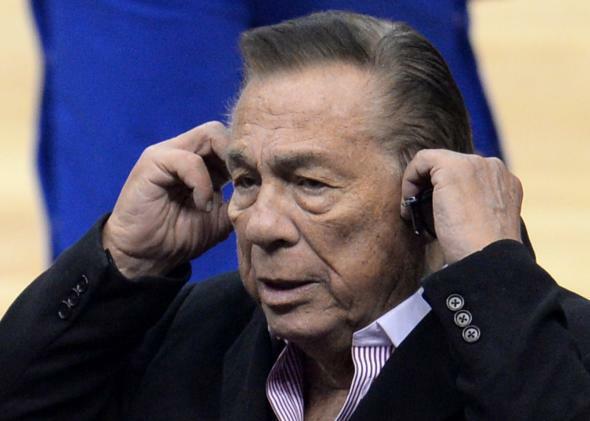 Donald Sterling exposes an uncomfortable truth about race and power in pro basketball. Donald Sterling seems to view his players as tenants on a basketball plantation. The average NBA player makes more money in a single season than most Americans will earn in a lifetime. The average NBA owner made more money while you were reading that first sentence than your children will accrue if they live to be 150 years old. LeBron James has a mansion. Portland Trail Blazers owner Paul Allen has a yacht equipped with two submarines and a music studio. And if he gets bored with lying around on one of the world’s longest superyachts, he can console himself by spending time on another of the world’s longest superyachts. Which superyacht does he like best? These are the questions that try NBA owners’ souls. For a billionaire like Allen, though, a big boat isn’t all that special—they’ll sell one of those to anyone these days. There are a mere 30 franchises in the NBA, meaning there are just 30 opportunities to buy in to one of the world’s most exclusive clubs. An NBA team is the ultimate middle-aged-rich-guy status symbol, an instant ticket to cultural cachet. How else can you explain the lowly Milwaukee Bucks selling for $550 million? The owner of a sports franchise acquires his cultural cachet by basking in the reflected glory of his players. There’s a dark side to that owner-player relationship that we don’t really think about, an uncomfortable truth that’s particularly fraught when you consider the racial dynamics at play in the NBA. A white plutocrat like Los Angeles Clippers owner/Hall-of-Fame-caliber bigot Donald Sterling doesn’t just own a basketball team. He owns the black players who suit up for that team, too. For the men who control the NBA, great basketball players are another kind of expensive toy—superyachts that can dunk. The Dallas Mavericks’ Mark Cuban is the most benign example of the athletes-as-playthings phenomenon. Cuban, a dot-com billionaire, has parlayed his wealth into a little boy’s fantasy of hanging out with the pros. When the Mavs’ Vince Carter hit an amazing three-pointer to beat the Spurs in the first round of the Western Conference playoffs, Cuban ran in to join the scrum, grinning maniacally as he wrapped his arms around his player’s waist. Carter, for his part, didn’t seem to notice that the guy who signs his checks had latched on to him like a koala. Sterling: You just, do I know? I support them and give them food, and clothes, and cars, and houses. Who gives it to them? Does someone else give it to them? … Who makes the game? Do I make the game, or do they make the game? Is there 30 owners that created the league? Sterling is not a typical NBA owner. I’d have to imagine that his basketball-world brethren see their employees as remarkably talented human beings rather than the needy, subservient recipients of charitable food donations. Even so, it’s impossible to ignore that pro basketball is a business in which most of the employees are black and the vast majority of the owners are white. A whole lot of NBA players are incredibly rich, and a bunch of them are cultural icons. But like Sterling says, it’s the super-duper-rich guys who control the league while the players provide the entertainment. When an NBA owner tells his players to jump, the guys in sneakers are contractually obligated to ask how high. On Sunday, the Clippers players showed that they don’t tolerate their owner’s behavior, wearing their warmups inside out in advance of their playoff game against Golden State. LeBron James has said that “there’s no room for Donald Sterling in the NBA,” and the Players Association urged Commissioner Adam Silver to give Sterling the maximum punishment allowable under the league’s bylaws. It’s also telling that two of the first owners to speak out against Sterling were the Kings’ Vivek Ranadivé and the Bobcats’ Michael Jordan, the rare men of color among pro basketball’s moneyed elite. If Sterling is sanctioned severely, that will send a message that the NBA won’t tolerate virulent racism, so long as it’s preceded by years of comparable bigotry, it’s captured on tape, and everyone on Earth gets really angry about it. But no matter what happens to the Clippers owner, we shouldn’t lose sight of who controls the NBA. The players can wear their warmups inside out or upside down, but they’re still serving at the pleasure of the owners, still raining in jumpers as the guys with music studios on their yachts clap their hands. That’s not going to change, whether Donald Sterling’s running the Clippers or not.